Lo and behold, green crabs turned out to be the most plentiful with spider crabs coming behind to a far second. Three girls from a group we had brought out with us helped Sam and I pull up the last cast of the day, having been left out while we went swimming. 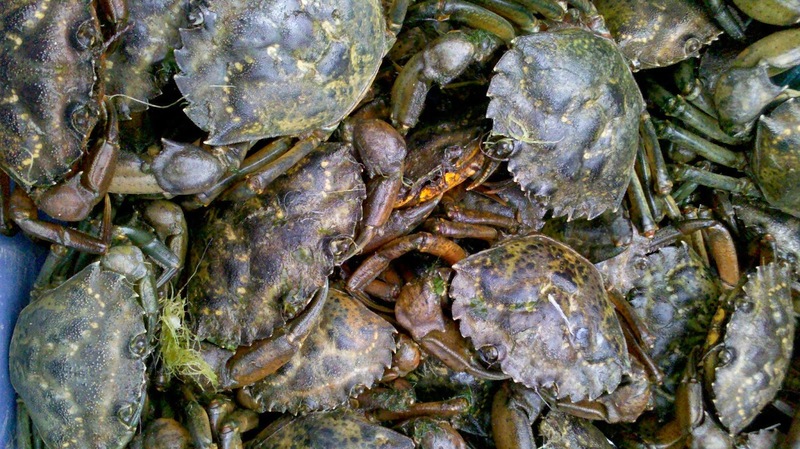 After the lugging and tugging on the rope, the line was finally brought up and there were at least 20 green crabs!! Most were still scrambling to eat parts of the mackerel and pieces of cod fish, not a care that they were surrounded by curious eyes which only saw alien-like creatures with aggressive pincers, climbing over one another. We all had so much fun counting the crabs and figuring out their genders. Soon, the girls became the experts - quickly grabbing the crabs and enthusiastically showing their friends and just about anyone around them. I am really glad to have been able to show them what crabs were and told them more about these marine species for them to share the knowledge with others.